Kevin Clapper hopes Toledo City Council makes a pilot program allowing recreational and commercial use of golf carts in designated areas a permanent perk of living in Toledo. 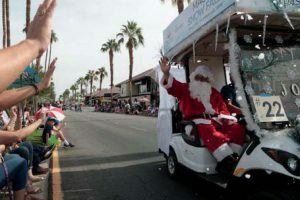 He’s the owner and operator of EZ Shuttles, which offers rides around town in one of three golf carts that sit five passengers each. He said the golf carts add to the growing appeal of living in or visiting downtown Toledo and pair well with other transportation and entertainment options such as pedal pubs, rental bicycles, and the designated outdoor refreshment areas. 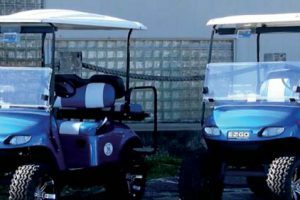 Council in 2017 approved legislation allowing golf carts and low-speed vehicles on public streets in Point Place, the Old West End, the Warehouse District, and downtown, so long as the vehicles are inspected and approved by the Toledo Police Department. So far the department has inspected 74, Deputy Chief Mike Troendle said. The pilot program is set to end on Dec. 31, but councilmen are considering a move to both make it permanent and expand its geographic boundaries. Deputy Chief Troendle said there have been no golf cart-related crashes since the program started and “very few” complaints. Drivers must be at least 16 and have a valid state driver’s license to operate the golf carts, and each vehicle must also be equipped with lights, a horn, brakes, and seat belts. 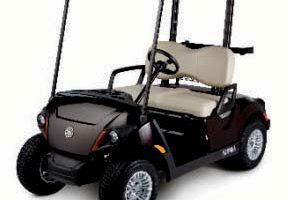 The golf carts must be properly licensed, must follow all state traffic laws, and cannot drive on any city street where the speed limit exceeds 35 mph. Council President Matt Cherry said he has received numerous complaints about golf carts parking on the sidewalk, which is against the city’s rules. Old West End resident Judy Stone said she enjoys driving her neighborhood in her personal golf cart. It’s slower than driving, so you get to know your neighbors, she said. She has also found that she’s spending more money downtown than before, partly because she’s saving on gas money but also because she’s discovering new places. She and other audience members Wednesday suggested council grow the golf cart boundaries to include the Amtrak Toledo Station, the National Museum of the Great Lakes, and the Toledo Museum of Art. Councilman Chris Delaney said he could support expanding the program, but only if it is limited to areas where the speed limits stay below 40 mph. Council likely will vote on the issue before the pilot program expires at the end of this year.